Keeping true to their promise of releasing two new champions every three patches for their free-to-play hero shooter, Paladins. Hi-Rez Studios has officially revealed who will be available in the upcoming OB 46 patch that’s set to release sometime this week on the PC. Dual magnums that fire every 0.7s dealing 700 damage. Begin rapidly firing your Magnums at the nearest target to you with perfect aim. Deals 1050 damage over 1.5s. Automatically aims at the nearest target including deployables. You have a Retribution target that is revealed to you when nearby. Killing your target grants additional Credits if they are on a killstreak. Activating Retribution randomly selects a new target. Enemies that kill you automatically become your new target. Activate to quickly slide forward in the direction you are facing. After a charge up delay, release an infallible surge of judgement that executes targets in range at or below 65% Health. Targets above 65% will take 600 damage and be slowed for 1s. Requires line of sight and does not travel through shields. [Combat Slide] Gain a 25% attack speed for 2s using Combat Slide. [Weapon/Armor] Your weapon shots deal 40% more damage to targets over 65% Health. [Retribution] Your target is also revealed to your teammates if they are revealed to you. 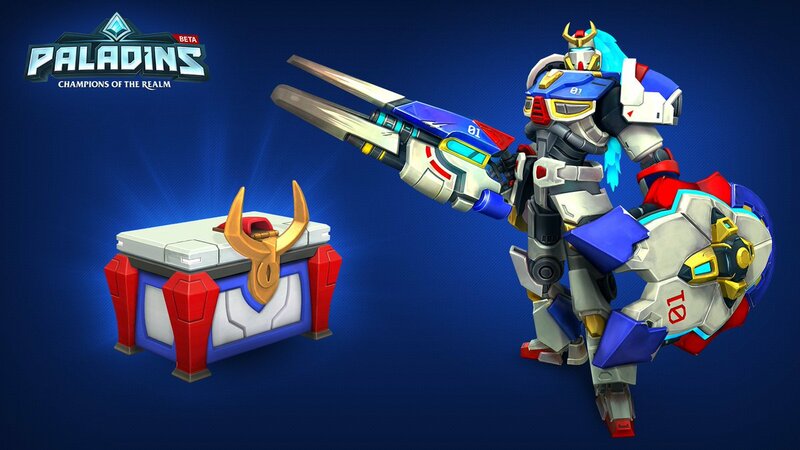 Alongside a new champion being revealed in the world of Paladins, Fernando is also getting a new set of cosmetic items which is none other than a mech suit called the “FN-01”. Check out the latest item to arrive here. It should be noted that the FN-01 suit cannot be directly purchased and is locked behind a new chest that will also contain pieces of the following sets: Triggerman Buck, Star Slayer Ruckus, Night Bane Cassie. Additionally, according to the PTS for the patch that went live, it seems that each chest roll will be 200 crystals. As per every patch for Paladins there’s a new round of character balancing which sees the struggling Fernando see a slight buff and a nerf to how quickly Drogoz can fill his ultimate meter. To read the changes in it’s entirety feel free to read them here. Paladins is currently available on the PC, PlayStation 4 and Xbox One.